Meanwhile lets just say that we are proud Phil contributed a whooping 481 entries. Very nice if you are rich enough to have it affect you (estates over $10M with poor tax planning) and it's very important to the GOP's Top 1% donors, who plan on living on through their clones and need to leave all their money to themselves. Think how annoying it would be if, every 60 years, when you are having you mind transferred to a new clone, you had to pay a tax to transfer your money. Of course the "death tax" needs to be elimintated but of course you can't tell your bible-thumping base the real reason or they might decide you are a Godless heritic. 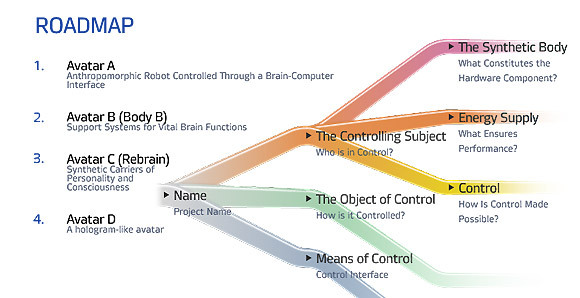 We are supposedly 5 years away from Avatar B, where your brain can be transferred from your body and the goal is put you into a machine or a clone over the next few decades. Well, not you, unless you are one of the ones with millions of Dollars to spend on such nonsense but at least we know that the people who can afford it WILL be able to take it with them and build up such unimaginable wealth over multiple lifetimes that the efforts of you and generations of your mortal family will be like dust in the wind under their immortal gaze. Speaking of Godless heritics, Oil (/CL) is spiking higher again today as Baghdad cranks up pressure on the Kurds following a controversial independence referendum, with a flight ban and a warning on oil exports, a vital source of income for Iraqi Kurdistan. Oil already spiked over $50 on news that Turkey was upset with the Kurds but now Iraq is another excuse to jam things up – $52.75 this morning and yes, we're still shorting! Which Way Wednesday – How Durable Is the Economy? Well, this is what we've been waiting for. 8:30 brings us the Durable Goods report and we keep shorting the Russell (/TF) Futures, unsuccessfully so far, in anticipation of a sell-off. Now we're favoring the S&P (/ES) shorts, as they are right on the 2,500 line – so it's easy to just set a stop above and short below to limit your losses. We're still using the $52 line to shore Oil (/CL) but taking quick profits when the dips reverse and, of course, tight stops above with a re-short at $52.50. That's what you have to do to play bearish in this market – quick in and out plays. Why play bearish at all? Well, we're playing short-term bearish because the bulk of our portfolio allocations are in long-term bullish positions. That's the case in both our Options Opportunity Portfolio and our Long-Term Portfolio, which has gained another $51,816 (3.2%) since our 9/15 Review. 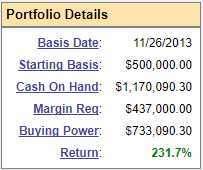 That portfolio is 100% bullish and is now at $1,658,699 from our $500,000 start on 11/26/13 (up 231.7%) and we strive to lock in those gains by spending roughly 1/3 of the gains on short positions – like our Russell and Nasdaq hedges. Of course, then we hedge the Short-Term Portfolio with additional longs and we tend not to lose the whole 1/3 we allocate to our shorts – it's just that we're willing to because we'd rather lock in 66% of our gains than go for broke – and end up that way when the market corrects (if it ever does). 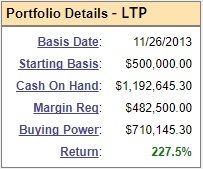 You might think we are not maximizing our gains but, of course, with a 58% average return, we're able to be far more aggressively bullish in our LTP than we would ever consider being if we didn't have our buffer hedges in the STP. Testy Tuesday – Is S&P 2,500 the Market’s Waterloo? Back on the 13th, I titled the morning Report: "Which Way Wednesday – S&P 2,500 or Bust!" and we've been teasing the line in the subsequent two weeks but now failing again as oil prices rise ($52 this morning, which is our new shorting line!) and Global tensions mount. Meanwhille, on the home front, the Republican agenda is failing in a most spectacular fashion as repealing Obamacare simply isn't going to happen (thank God!) and now they are far over-reaching on Tax Cuts, with a plan that will add Trillions of Dollars to the National Debt with no offsetting spending cuts – all just to benefit the Top 1% – it's not going to fly either. The markets are still wildly underpricing the overhanging threat of war in North Korea. We are, in fact, still at war with North Korea – having never signed a peace treaty since that war started in 1950. Meanwhile, back in the middle east, Turkey's President and Trump Thunder Buddy, Erdogan has threatened to invade the Kurdish region of Iraq as he is enraged by their vote for independence (Turkey also has a larget Kurdish region so he considers it a bad example). 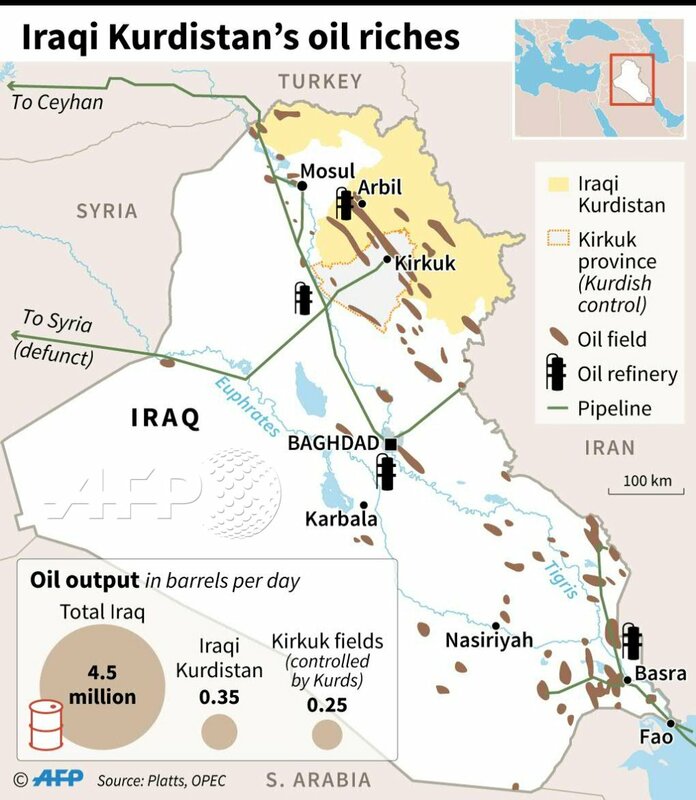 Key to this conflict is a major oil pipleline that runs from Kurdish Iraq through Turkey which Edrogan threatens to cut off (hence the jump in oil) as well as warning: "“Our military is not (at the border) for nothing. We could arrive suddenly one night." We need to take Edrogan seriously – this is the guy who had his security detail beat the crap out of protesters in Washington DC and again in New York – even after he was told what they did in DC was not acceptable. "You're on a suicide mission." "No, you're on a suicide mission." "Rocket Man" "Dotard". That pretty much sums up the weekend tweet wars between fearless leaders Donald Trump and Kim Jong Un, who both finally found someone to play with that understands them. Nort Korea's foreign minister told the UN on Saturday that North Korea "will strike premptively if needed" and the US countered by sending bombers right to the edge of North Korean airspace in a massive escalation of events not seen since the Cuban Missile Crisis – yet the markets are just shrugging it all off this morning. “The very reason the DPRK had to possess nuclear weapons is because of the U.S."
Ever the diplomat, Trump followed that up Saturday night on Twitter, posting: “Just heard Foreign Minister of North Korea speak at U.N. If he echoes thoughts of Little Rocket Man, they won’t be around much longer!” Trump's bombers, of course, flew out of Guam – effectively making North Korea's poiint that the base is a direct threat to them. North Korea’s state media issued a statement Saturday from the National Peace Committee of Korea describing Trump as “wicked” and “a rabid dog.” U.S. analysts now estimate that North Korea may have as many as 60 nuclear weapons, according to a Washington Post report. Of course, Trump is just following the grand tradition of name-calling practiced by all our greatest leaders, remember when Kennedy called Kruschev "Little Nicky"? No, of course, not, becasue President Kennedy wasn't a moron! 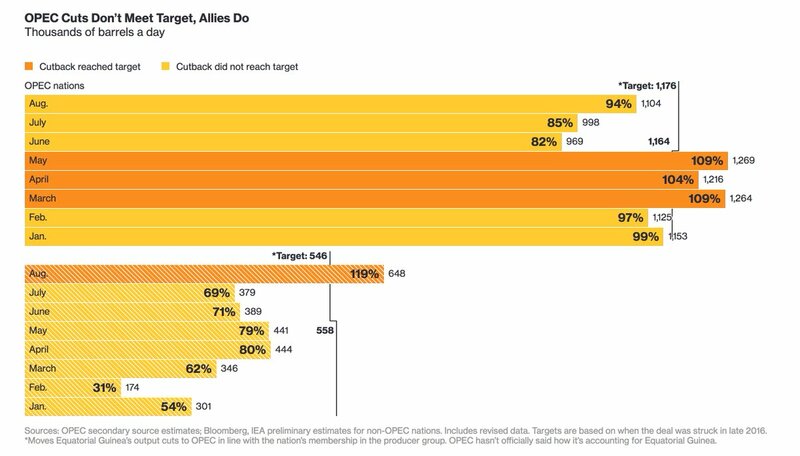 After saying they would for the last 10 days, driving oil from $47.50 on 9/11 to $51 (7.4%) on Wednesday (now $50.45), OPEC has now decided they will "wait and see" what happens between now and their March meeting. As U.S. shale oil continues to thrive and seasonal demand wanes, the surplus that has weighed on markets for three years could return. If OPEC doesn’t extend the supply curbs, the market will return to oversupply again, forecasts from the International Energy Agency indicate. 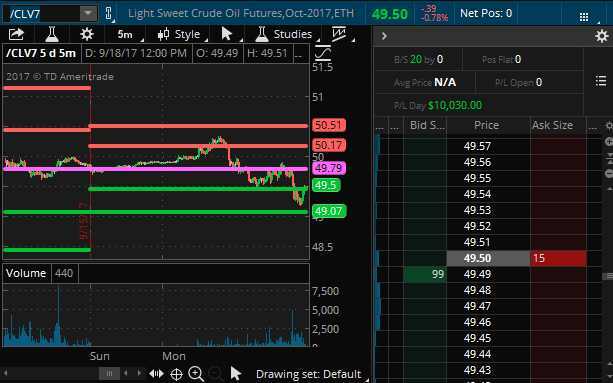 Our average on the Oil (/CL) Futures shorts is $50.48 on 10 contracts and we're waiting fo the great unwind, which probably won't happen today as the weekend is here but these contracts run until 10/20 and there are 1.267Bn FAKE!!! orders over at the NYMEX in the front four months – so we're pretty confident there will be a catastrophic sell-off at some point. Fed Day Follies – Dollar Crashes in Anticipation of MORE FREE MONEY!!! It is if you get paid in something other than Dollars, or if your assets are not Dollar-backed. Otherwise, it's 3.4% less great than it was in November – as measured by Global confidence in our currency. Cutting taxes, running up Government spending, threatening war (s) and easy money policies are no way to strengthen a currency. US Household Wealth is roughly $100Tn so a 3.4% cut in the value of those Dollars means $3.4Tn was essentially taken from us – pretty much confiscated by our Government. That's a lot worse than any tax because it's 3.4% of EVERYTHING we have. Fortunately for those of us in the Top 1%, a lot of that $3.4Tn went right back into the market, where we have the bulk of our wealth anyway and, of course, we have enough money that we diversify our assets into other currencies and, of course, Gold, which has flown up from $1,125 to $1,325 (17%) since the election. So thank you, Bottom 99%, for your contributions to our portfolios. We couldn't have done it without devaluing everything you own! In yesterday's morning Report, we discussed the massive debt bomb we are facing and looked at the Fed's projections and concluded the market may be wrong and the Fed may tighten at this meeting. 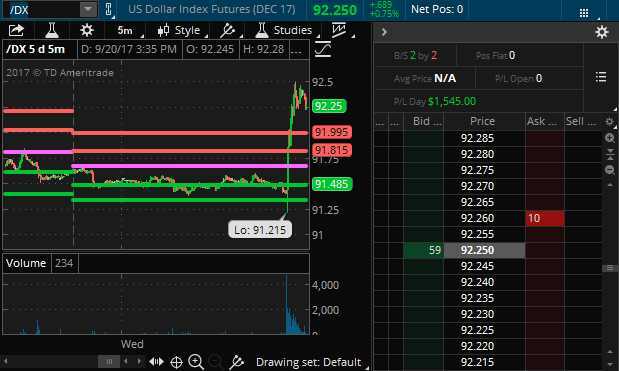 If they do, the Dollar will shoot higher and shorts will cover so I like Dollar Futures (/DX) long over the 91.50 line – with tight stops below. If the Fed surprises us and brings rates up 0.25%, expect the /DX to move up to at least 92.5 for $1,000 gains per contract. Don't forget, Japan, Europe and China do not want a weak Dollar – this is the point they are likely to step in and prop it up anyway – so I feel pretty good about that play. If you are Futures-impaired, you can use the Dollar ETF (UUP) as a proxy. It's at 23.80 and the October $23.50 calls are just 0.45 so 0.15 in premium isn't bad for a month's worth of leverage, right? Testy Tuesday – All Time Highs Ahead of the Fed, What Can Go Wrong? Well, for one thing, the Fed could tighten. 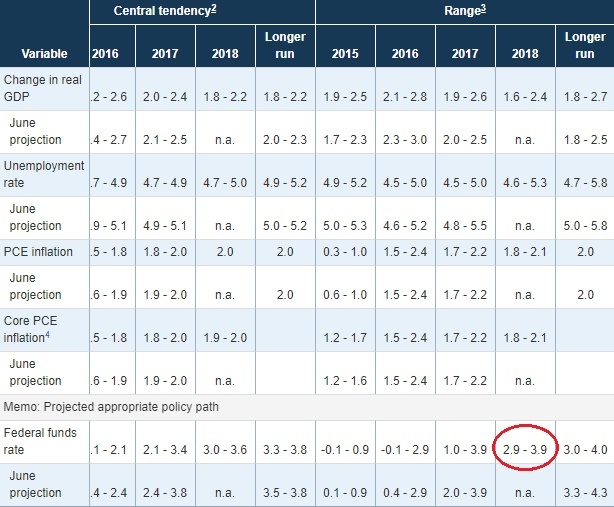 As you can see from the Fed's own projections, which are to be released tomorrow (but are on their web site today), the Fed is projecting a Fed Funds Rate of 2.9-3.9% next year. This year it was a much wider -0.1 to 2.9% and we're right in the middle at 1.25% but what if we're in the middle next year at 3.5%? Are you ready for a 2.25% rate hike? Is anybody? Certainly people with adjustable mortgages are not ready or revolving debt (reccord highs) or variable loans like Corporations tend to have, which would add $400Bn to their $2Tn debt balance. Are the banks ready to have their loan margins squeezed as rates climb, which is often the case? Even just 3% would require 7 rate hikes in 8 meetings – unless the Fed hikes us this year, then it would be 6 of 8 or, if they surprise us and hike tomorrow, they buy a bit of fexibility next year and "only" have to hike rates 0.25 every other meeting, plut one. Their other projections are on track. The market thought lowering the Q3 GDP forecast (see yesterday's Morning Report) would keep the Fed off the table but they are only projecting 2.0-2.4% GDP for 2017 and LESS next year – so we're right on track. Unemployment is below their target, Inflation is above – there's really no excuse for the Fed NOT to raise rates so don't be surprised if everyone is surprised tomorrow by a quarter-point hike, hurricane or no hurricane. 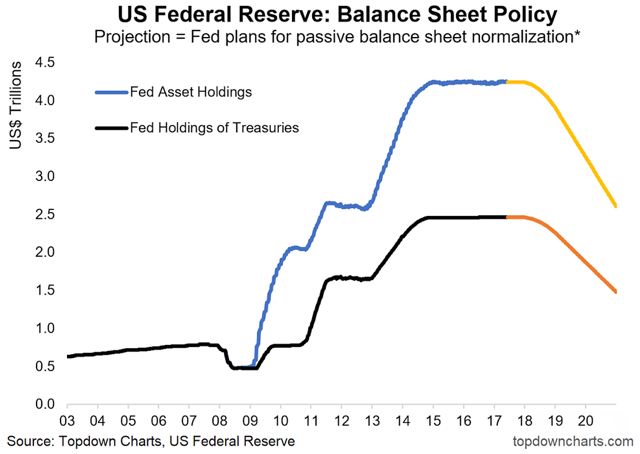 Of much more concern than the rates going up (though the repercussions of that alone will be tragic) is the potential unwinding of the Fed's Balance Sheet, which currently stands at $4.47 TRILLION and that's up about $3.7Tn since 2008. “What we’re doing is being responsible where North Korea is being irresponsible and reckless. Can we ignore more terrorism today?